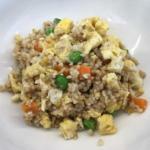 This quick and healthy twist on ham fried rice is a favorite of mine and my kids. I actually use steel cut oats instead of brown rice, mostly because they are so quick to make. Also, oats offer more nutrients overall than brown rice. Hope you enjoy! Cook brown rice or steel cut oats according to directions. Cook eggs as desired. I just mix them in a bowl and microwave them for 1 1/2 minutes. Mix in warmed peas and carrots, aminos and vinegar. Serve. Bragg Liquid Aminos is a Certified NON-GMO liquid protein concentrate, derived from soybeans, that contains the following Essential and Non-essential Amino Acids in naturally occurring amounts Alanine Arginine Aspartic Acid Glutamic Acid Glycine Histidine Isoleucine Leucine Methionine Phenylalanine Proline Serine Threonine Tyrosine Valine Lysine Great on Salads & Dressings, Soups, Veggies, Rice & Beans, Tofu, Wok & Stir-frys, Tempeh, Casseroles, Potatoes, Meats, Poultry, Fish, Jerky, Popcorn, Gravies & Sauces, Macrobiotics. Ingredients Our Bragg Liquid Aminos are made from health-giving, NON-GMO soybeans and purified water. They are an excellent, healthy, gourmet replacement for Tamari and Soy Sauce. Not fermented or heated and Gluten-Free. Bragg’s has a small amount of naturally occurring sodium. No table salt is added. If less sodium is desired use a 6 oz. Bragg’s spray bottle and dilute with 1/3 distilled water or to taste and then either add in or spray on food. Where can I buy liquid amines? I’ve never heard of it. What are the benefits? I am going to try this recipe tomorrow and can’t wait. It looks so yummy. I sure wish you would publish all these great dishes. I am on a a program that allows me to count calories. I write everything down daily on what I eat. I allow myself between 1200-1500 calories a day. No snacking in between meals. One thing that keeps me from nibbling is sucking on ice. I can do this with no problem. I go through a 32 oz. cup four times a day. I wake up between 6:30 and 7:00 AM. I had a pace maker placed and it makes the difference between night and day. By the way, my cardiologist is adorable. Oh my goodness, I am writing a journal. Thank you again for all the yummy foods. Can’t wait till your next post.